Lillian Cutts, BSBA '15, a native of Burlington, Vermont, calls herself a "musician, graphic designer, virtual reality enthusiast and cocktail creator." She is drawing her own life map from lessons she learned in her self-designed major in entrepreneurship and marketing, along with a minor in graphic design. Cutts says creating her own major, as encouraged by one of her advisors, helped her to apply herself because she was always interested in the work. "I never would have thought to do that on my own," she says. "Kogod taught me problem solving and [the ability] to think outside the box," she says. "Being the kind of person who doesn't always fall into one box or another, it really worked for me. It showed me that if you don't succeed the first time, you can always try again. I had a professor who said, 'Every business venture you don't try is a failure'." 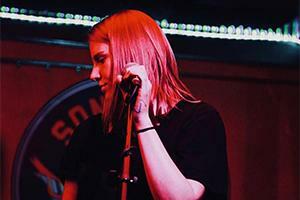 As one half of the electronic duo CUTTS in which she sings, writes songs and produces alongside fellow American University alumnus Peter Bonaventure MA '17 in Audio Technology, Cutts is gaining recognition as a musician, a fact that she attributes to the marketing skills she acquired in school, as much as raw talent. "You can make the best music ever, but if you don't have a brand, people aren't going to connect with it," she says. "Vice versa, if you have a solid brand but not a good product, people are going to disconnect with it. It's all weirdly related to my studies in a way that I didn't see it being related." She and Bonaventure have been able to create a good product, one that suits both of their needs and gifts, by creating through collaboration. "We bring really different things to the table. When Peter and I started working together, he was trying to market his skills, and I was like 'I want to do something weirder,' and we met each other halfway. It turned into a song that you can relate to in a way that wasn't cookie cutter but also wasn't too artistic." The value of collaboration and accountability to colleagues is a lesson Cutts also applies in her role as a co-founder of Augment Arcade, DC's first virtual reality experience arcade, located in the FLASH nightclub in the growing Shaw neighborhood. "If you don't show up at school, the only person you hurt is yourself. At the arcade, you're hurting the other members. We're starting this from the ground up." As if musicianship and the VR arcade weren't enough, Cutts is also a freelance graphic designer, a job in which she says she is accountable not only to her clients, but to her own deliverables and sense of professional self-worth. "Don't undervalue your work," she says. "You'll put in more time than you want to and clients won't value what you do." Cutts attributes her work ethic, and her ability to value her work, to an entrepreneurship professor, Tommy White, in her senior year. When she and her team developed senioritis and started to slack, she says, he took them to task. "Those are the best teachers," she says, "the ones who challenge you to be better than yourself. In the real world, you don't have professors to hold you accountable." As Cutts continues to build her path from passion to success, she appreciates that Kogod excels at nurturing out-of-the-box thinkers like herself, those who are not necessarily suited for a traditional business path. "When I graduated, everyone was trying to get jobs, going to conventions," she says. "You don't have to have a super laid-out career path. You can do something you like and maybe that will lead to something that pays you." Learn more about Lillian Cutts and Kogod's BS in business administration program.